Latina Equal Pay Day is Nov. 1. 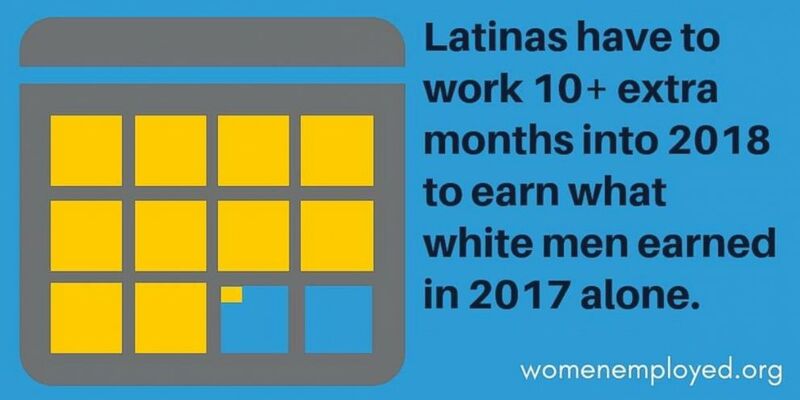 It falls on this day, 10 months and one day into 2018, because a woman of Latin American descent would have to work that amount of time plus all of 2017 in order to make what white men earned in 2017 alone. Latinas earn, on average, around 53 cents for every dollar earned by white, non-Hispanic men, according to the Labor Council for Latin American Advancement. Women overall are typically paid around 80 cents for every dollar their male counterparts earn. Latinas fare the worst in the gender wage gap, falling behind every other demographic, according to the American Association of University Women (AAUW), a non-profit organization dedicated to empowering women and girls. This graphic was released by the LCLAA on Latina Equal Pay Day. This year, white women had to work until April to earn what their male counterparts earned in 2017 alone. Equal Pay Day for black women, who make 63 cents on the dollar, was observed in August. Native American women make 57 cents on the dollar, with their Equal Pay Day on Sept. 27. Equal pay advocates took to social media Thursday to draw attention to the issue. Organizers of Latina Equal Pay Day are also holding a power summit Thursday in Atlanta. There were about 11.1 million Hispanic women — which includes Latinas — in the civilian labor force in 2015, representing one in seven women in the labor force, according to the U.S. Department of Labor. Even with that visibility, most Americans are not aware of the pay gap between Latinas and white men and women, according to research conducted by LeanIn.org, an initiative founded by Facebook COO Sheryl Sandberg. The National Partnership for Women and Families, a non-profit organization that promotes fairness in the workplace, pulled the numbers to see how the lives of Latinas would change if they were paid equally. The Partnership found that with no wage gap, a Latina working year-round and full-time would, on average, be able to afford more than three additional years of child care; three more years of tuition and fees for a four-year public university, or the full cost of tuition and fees for a two-year community college; 3.7 years' worth of food for her family; nearly 18 additional months of mortgage and utilities payments; or more than two additional years of rent. As a whole, the gender pay gap results in $513 billion in lost wages each year for women, according a report recently released by AAUW.